Canadian born, but raised in Spokane, WA, Rypien enjoyed a stellar high school career being named all-state in three sports. Concentrating on football, he signed with Washington State University where he enjoyed continued success being named all-Pac 10 in 1984 and honorable mention All-America in 1984 and 1985. 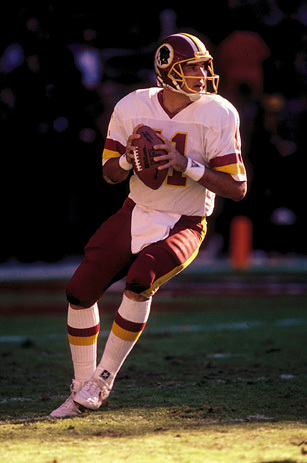 Drafted in the sixth round of the 1986 draft by the Washington Redskins, Rypien played for Redskins, Browns, Rams, Eagles and Colts in a career that ended in 2001. During that span he passed for 18,473 yards and 115 touchdowns and was chosen as NFC player of the Year in 1991. The two-time Pro Bowler’s proudest moment came in 1992. 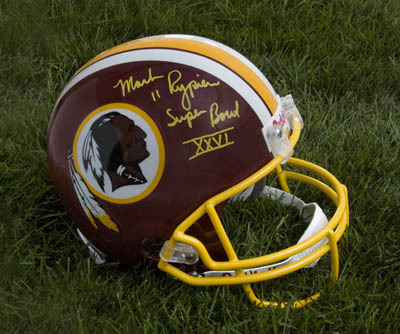 Rypien led the Redskins a 37-24 victory over the Buffalo Bills in Super Bowl XXVI, passing for 292 yards and 2 touchdowns and was chosen Most Valuable Player. 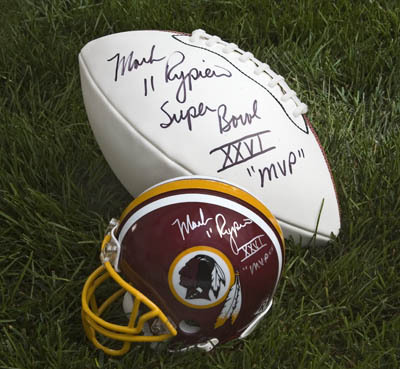 Mark Rypien’s proudest moment as a football player came in the 1992 Super Bowl when he led the Washington Redskins to the NFL Championship. Rypien threw for 292 yards and two touchdowns and was named MVP. Throughout his career, Rypien dedicated himself to the game of football. As a standout at Shadle Park High in his hometown of Spokane, Washington, he received a scholarship to Washington State University. At WSU, Rypien earned first team All-PAC 10 honors in 1984. He continued his outstanding football journey with a 14-year NFL career. Today Rypien’s energy is directed toward a more personal endeavor. In ’04 the Mark Rypien Foundation was established to raise funds to support activities and research associated with children with cancer in the greater Spokane, Washington area. Rypien lost his son, Andrew, to cancer in August of ’88 and the Foundation was established to increase awareness and assist families with children fighting the disease. The organization sponsors two major fund-raisers a year, a wine makers event and a golf outing. Approximately $300,000 is raised. Rypien said the intent of the organization is not to support cancer research – that takes millions of dollars – but to give these unfortunate children hope, anything that might help to lift their spirits. Among the activities afforded these children is a chance to experience the great outdoors which the Pacific Northwest has so much to offer. It’s called Camp Good Times, located 25 miles outside of Spokane in Idaho. Cancer patients are able to bring one family member with them and they’re able to mingle with other children who suffer from cancer and its effects. Rypien devotes most of his time and energy to his organization. What time is left he spends with his two teenage daughters, Ambre, 17, a senior in high school who will attend the University of Alabama in the fall, and Angela, 15, who just completed her first year in high school. Although Rypien was raised in Spokane and continues to live there, he was born in Canada and lived there for five years before his family moved to Washington. He comes from an athletic family that includes two younger brothers, Tim and Dave. Shadle Park won state titles in baseball and basketball while the three were there. Mark Rypien was all-state in three sports and while he made his name on the football field his brother went on to excel in baseball. Tim Rypien was a member of the Canadian National Baseball Team and spent four seasons in the Toronto Blue Jays farm system. Dave Rypien made the Canadian Olympic team and played at Gonzaga University. In what is another Gonzaga connection, the Rypiens played against John Stockton (Gonzaga graduate, Utah Jazz fame) in high school as Stockton played for Gonzaga Prep (the school Rypien’s daughters attend). And, somewhat surprisingly, the Rypiens never lost to Stockton and Gonzaga Prep on the basketball court. It is in Canada where their Polish heritage had the greatest impact. They still go back to Canada for weddings and re-unions livened by Polish music and food. Attempts have been made to find the Polish origin of his last name but no firm answers have been found. Regardless, Rypien is proud to be Polish (father is Polish, mother is Czechoslovakian) and his credentials are certainly more than worthy to make him one of the newest members of the Polish-American Sports Hall of Fame. Not one to leave out his roots, Rypien prefers to refer to himself as a Polish-Can Am. Rypien began his professional career in ’86 after being selected in the sixth round of the NFL Draft. Two years later he became a starter for the Redskins. He holds the club record of six TD passes set against Atlanta in ’91. Rypien passed for 3,768 yards in ’89, the second best total by a Redskin quarterback. Following the ’91 season he was named NFL Films and Football News NFC Player of the Year, and was named to the NFL All-Pro first team. Because of Andrew’ illness Rypien left the game in ’98 to spend more time with his family. At the encouragement from his daughters Rypien returned to the NFL in ’01 and signed with the Indianapolis Colts playing behind Peyton Manning. Even before his NFL career, Rypien made a name for himself, and Washington State as well. In 30 career games at WSU he passed for 4,573 yards; 5,101 yards in total offense. These statistics rank him second in school history trailing only Jack Thompson. In the ’85 season opener against Oregon Rypien passed for 403 yards (412 total yards) to establish WSU records. The Cougars averaged 4,851 yards (441 passing) per game in 1985, a school record. Rypien led WSU to a Holiday Bowl appearance and earned All-America honorable mention in ’84 and ’85 by the Associated Press.